Yes, I am thinking a lot about back to school. It started with wondering how on earth I’m going to come up with good lunches for my picky daughter (leading to my new interest in Laptop Lunches and other reusable lunch bags), but I do have to get other things for my daughter too. No backpack, though. Her one from last year is just fine. She still loves it and it’s in great condition. 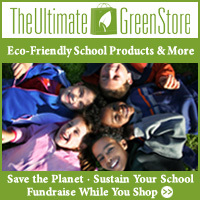 Office Depot offers an entire Buy Green section on their site. I’m rather fond of them since I don’t have a car available to me when my husband’s at work and they deliver for free on orders over $50. If you’ve every had to buy printer ink, you know how easy that is to reach. And they do have printer cartridge recycling available too, although I think you have to go in store for that. I think sometimes they use the AP nontoxic certification to mean green, at least with crayons and markers, rather than any sort of more clearly green standard. I could wish for a more clear standard on these things, or maybe the soybean crayons I hear Prang makes. I don’t have a lot to buy. The main thing I need to do is make sure we have appropriate supplies at home. We can donate if we like, and I’ll be checking to see if they have any need of a huge stack of old printer paper. You know, the kind for the old printers with the holes down the side. My husband found a huge stack at work, probably a couple years’ supply for the kids at home. But I do have to watch our supply of crayons, glue and similar items. Both kids can go through these pretty quick, and explaining that a broken crayon still works isn’t what many a 5 year old wants to hear. I figure I’m pretty lucky to not have to buy a whole lot this year. It won’t be that much longer before I won’t be able to get away with using that old printer paper for school assignments, as she’ll eventually need lined paper rather than plain.